ABUS Diskus 24IB/50 wins "Best on Test Award"
The ABUS Diskus 24IB/50 was one of twelve padlocks tested by 'Practical Boat Owner' magazine with padlocks supplied by online specialist Nothing But Padlocks. The PBO tests were conducted to determine the "best padlock" for marine environments, taking account of cost, corrosion, strength, durability and consequent security. The latest development in Carl F Groupco's long-standing partnership with West Port is the supply of the innovative Ingenious locking solutions. With Privacy by Design, integrated Gluu access management and comprehensive support for regulatory data compliance, Qvarn is set to become the Europe-wide platform of choice for managing workforce identities and providing associated value-added services. Genius Vision offers a free non-commercial version of NVR - If you have a personal security system and want to be able to monitor that system remotely, then a NVR may the solution for you. NVR or a network video recorder provides a means of recording video to external as well as internal storage devices via a dedicated device. Who's the new KIBB on the block? KIBB locks are an upsell product. Sell them to customers who want a security upgrade, because that's what they are. In the same way you sell an anti-snap euro cylinder, sell these as an anti-jemmy lever lock. Hickleys add locksmith training to their Auto Locksmith training academy. Hickleys are pleased to announce that they are expanding their training academy with new dedicated training rooms, training equipment and courses to meet the need of domestic and commercial locksmiths. In celebration of Keyline's glass transponder chip launch, Tradelocks are putting a huge promotion on all Keyline smart cloning solutions. 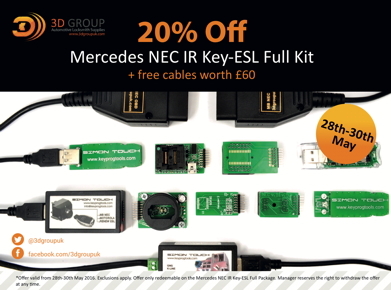 For a limited time only, Keyline cloning products will be available at record low prices; you can get your hands on the new range of glass chips, electronic heads, Ford remote keys, emergency keys and universal smart remote keys as well as Keyline smart cloners and both the Megamos and Megamos Xtreme software at remarkably low prices - giving you a massive choice of cloning solutions! Ideal for use on uPVC and aluminium doors, the Borg BL6100 Code Lock has been specifically designed to easily fit to lift and turn multipoint locks. The lock is the only product of its kind on the market as it boasts a unique double-button press design, which allows each digit to be used twice in the code and provides greater levels of security. The handle also protects against forced entry as it stays permanently clutched until the correct code is entered. Boon Edam has installed Turnlock 100 full height turnstiles at the Multipurpose North Terminal of Callao in Peru as part of a large-scale physical security plan to protect one of the largest marine terminals in the region from criminal activity. The Multipurpose North Terminal of Callao Port joins a global trend in the use of security technology to combat crime. Studies have shown that ports in developing nations are the most vulnerable to criminal acts at ports. Schlage, a brand of Allegion that has created the most technologically advanced lock products to help multi-family property owners secure and manage their units while streamlining operations, is announcing its latest brand innovation in the multi-family space: the new Schlage Control Smart Interconnected Locks. MOBOTIX AG has released details of a project for the Torridon Hotel that has upgraded its CCTV to take advantage of state of the art MOBOTIX video security including advanced thermal imaging technology. Set in 58 acres of parkland at the end of a magnificent sea loch, the Torridon has one of the most spectacular and idyllic locations in the country. As the only hotel in Scotland to win the coveted Automobile Association, "Hotel of the Year" twice, the Torridon has attracted a number of high profile guests and the location for a number of films and TV series. Satellite products from Globalstar provide reliable ubiquitous communications to help emergency, operations and security personnel work more efficiently and safely. With Sat-Fi, connect to Globalstar's satellites using any smartphone or tablet, wherever you are. The GSP-1700 satellite phone delivers crystal-clear calls anywhere. With SPOT Gen3, send an SOS with the touch of a button. Rely on Globalstar to stay connected when you need it most. Hickleys are holding their annual customer weekend called Simply Keys on the 18th & 19th June in Wolverhampton. 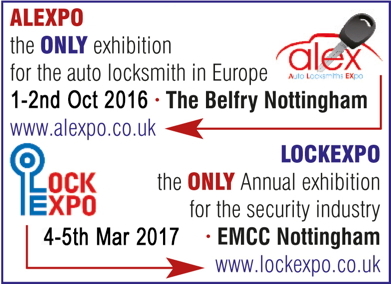 If you are an Auto Locksmith, offer vehicle key cloning or are interested in entering this market, this is the place you have to be to see the latest in vehicle key solutions. Simply Keys is not a conventional trade show, it is packed with vehicle demonstrations, product demonstrations, technical discussion and presentations. The private security company responsible for the colossal blunder that led to Old Trafford being evacuated amid terror threat concerns on Sunday are likely to be dumped by Manchester United. Security Search Management & Solutions are understood to be the firm brought in to help conduct a training exercise involving sniffer dogs at Old Trafford last Wednesday. Everyone in the locksmithing world knows and respects esteemed professional Chris Belcher, and Tradelocks are proud to have been associated with him over the past 6 years. On display at this year's IFSEC will be Comelit's NEW Maxi IP Monitor available in two versions: 2-wire and ViP, along with a full range of internal monitors, external panels and home automation technology. The colour door entry monitor, Icona Manager, offers a full range of home automation functions for controlling domestic installations and devices, from heating to alarm systems and audio distribution. As announced here last week the registration to attend the ALEX show 2016 set to run on 1st and 2nd October at the Belfry Hotel Nottingham, is open for everyone. We have had a huge response and we urge you to register to come to the show. After being given full approval by the European Parliament, the data protection reforms have now been published in the Official Journal of the European Union. The two year countdown begins now as the Regulation will apply from 25 May 2018 and the Directive from 5 May 2018. Further updates will be published over the coming months on the ICO’s dedicated data protection reform website. The Send for Help Group, which owns subsidiary brands Skyguard and Guardian24, has been confirmed as the world's largest lone worker protection provider in a recent market research report. The 'People Monitoring and Safety Solutions' report published by business intelligence specialists Berg Insight states, "The Group is now the leading lone worker protection service provider worldwide, with a combined subscriber base of more than 100,000 end users across several vertical market segments in the UK." Get massive savings on 6 lever mortice locks and accessories this week at Tradelocks! Kitemarked to BS3621 British Standard, both the dead lock and sash lock are packed with security features, and are by far the lowest priced Kitemarked mortice locks on the market. Derbyshire Community Health Services NHS Trust has turned to Skyguard's BS 8484 approved personal alarms to safeguard their community-based staff tasked with providing in-home services. Transom closers and hook locks from Alpro have been installed in a new visitor centre at Sudeley Castle near Winchcombe in Gloucestershire. The castle lies in a 1,200-acre estate on the Costwold Hills and was used by Richard III as a base during the Wars of the Roses. It is also the last resting place of Katherine Parr, a wife of Henry VIII who outlived him.